Lawyers in large law firms in Australia averaged 34.8 hours of pro bono legal work in 2016 — 9.7% more than in 2014, according to a new report by the Australian Pro Bono Centre. 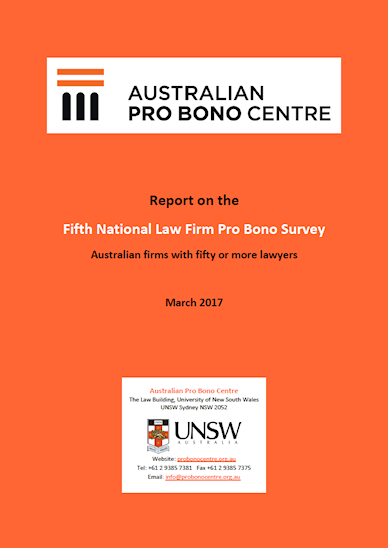 The Report on the Fifth National Law Firm Pro Bono Survey: Australian firms with fifty or more lawyers collates and analyses data provided by 41 of the 58 large law firms in Australia, including 19 of 20 of the largest firms. This growth in pro bono can be traced mainly to firms of between 201 and 449 FTE lawyers — where pro bono rose by 39.7% on a per-lawyer basis (to an average of 35.9 hours) — and firms of between 50 and 200 FTE lawyers, where pro bono increased by 26.1% on a per-lawyer basis (to an average of 22.2 hours). In the seven largest firms in Australia (more than 450 FTE lawyers), pro bono performance remained generally stable at an average of 39.4 hours. A key driver of this growth is the rising unmet legal need of asylum seekers. Immigration, in 2016, ranked third in the list of areas of law in which the most pro bono work is done, moving up from twelfth in 2014. Forty percent of firms in the Survey listed immigration in their top five areas of pro bono practice, up from 15% in 2014. Notably, in 2016 several firms doing this work paid sums of more than $25,000 to cover interpreter’s and translator’s fees in these matters, there being no other option for the clients involved. In every Survey Report since 2008, family law and criminal law have been the areas where requests for pro bono assistance were most often rejected by large firms. The 2016 Survey was no exception. The next most rejected areas were, in order, immigration, debt and employment law, indicating continuing unmet legal demand in these areas. In this Report, the pro bono participation rate amongst lawyers in the respondent firms increased for the first time since 2010, with the average rate rising to 57% of lawyers in the firm, up from 50% in 2014. The participation of partners also rose from 40% to 46%. Seventeen of the firms met the National Pro Bono Aspirational Target of 35 hours per lawyer per annum, up from 12 firms meeting it in 2014. “Despite this impressive growth, the performance across the 41 respondent firms is still quite uneven, ranging from 4 hours of pro bono work per lawyer a year, to 71 hours. There is clearly room for a much stronger effort at several firms. ‘The Survey allows firms to benchmark themselves against their peers and firms are encouraged to do so”, said John Corker, CEO of the Centre. However, there are indications in the Report that further growth may be limited due to constraints on the capacity of large firms to take on more pro bono work. 83% of firms cited ‘firm capacity’ as one of the three biggest challenges facing their pro bono program, and over half said that their internal pro bono target was likely to remain the same in 2017. Direct requests from people or organisations seeking pro bono help remains the most common source of pro bono work for large firms, with 38% of new matters arising this way. However, the data also shows a growth in responses to requests from Community Legal Centres (CLCs). In 2016, overall large firms received 20% of their pro bono matters from CLCs, with mid-size firms receiving up to 33% of matters this way. “It is good to see CLCs increasingly taking advantage of the pro bono legal services available but we are concerned at the impact of the forthcoming funding cuts to CLCs. There is neither capacity nor I think a willingness on the part of private law firms to bridge the massive gap that will open up if the funding cuts are not reversed, said Chair of the Centre, Phillip Cornwell. “Further, many firms rely on partnering with legal assistance services such as CLCs to provide pro bono assistance. The funding cuts will not only reduce the capacity of CLCs to provide services — they may also reduce the ability of law firms to do pro bono work.” said Cornwell. The previous Survey Report in 2014 raised questions about where the balance should lie as between pro bono legal work for organisations and for individuals. Encouragingly, the 2016 Survey results showed that the split has shifted from 65% for organisations and 35% for individuals in 2014, to 56% for organisations and 44% for individuals in 2016. Among the firms of between 201 – 449 FTE lawyers, the split was 50/50. “As the pro bono ethos for lawyers stems from an ethical professional responsibility to improve access to justice, it is vital that law firms devote a significant part of their pro bono programs to directly helping individuals”, said Corker. developing an ‘app’ to assist low income and socially disadvantaged tenants report items that need repair. offering secondments more widely throughout the firm.